RMT price in July is not much different from a previous month. Most of the games in our list have a slight increase in price, including World of Warcraft despite going to release its newest expansion soon. Tera has been doing very well with their costume strategies causing over 30% price rise. Guild Wars 2 had a tremendous increase as well from its upcoming patch but the effect might not last that long. WildStar Gold price had a severe decrease although it just released a big patch update. ArchAge Gold price in July is only slightly higher than a previous month. Patch 3.0 is finally hit the Korean server bringing several game updates, especially on the trade system. Because of this, the upcoming update is going to effectively impact RMT on the western world when it is released. We still do not know when the patch 3.0 will be added to NA server. 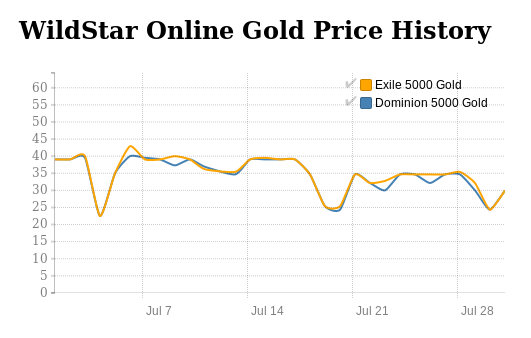 Until then, ArcheAge Gold price should remain unchanged like it was in July. 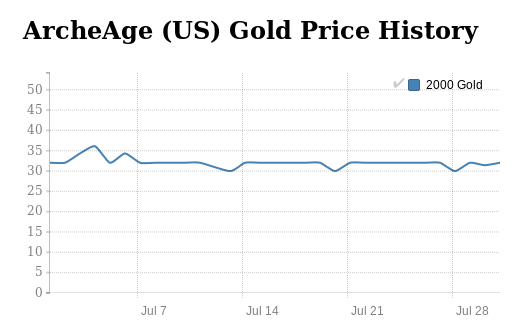 The cheapest Archege gold was on July 28, 2016, which is 2,000 ArcheAge gold for (US) $29.98 and the most expensive was on July 4, 2016, for $36.09. It is at 20.38% difference. Blade and Soul Gold price in July did not change much even though being slightly lower than a previous month. Throughout the month, the in-game currency price stayed in the range of ~$0.67 USD per 10 Blade and Soul Gold. New content released on July 20 adding new storyline as well as heroic dungeons did not have a single impact on its RMT market. Blade and Soul should be released new contents over a period of time as refer to last month producer’s letter. However, it should not a big impact to Blade and Soul Gold price. The cheapest was on July 23, 2016, which is 10 Blade and Soul Gold for $0.65 and the most expensive was on July 03, 2016, for $0.73. It is a slight 12.31% difference. The effect of Patch 3.3 from to FFXIV Gil price still remained as expected. It caused the Gil price to be as high as $20.50 USD per 5m which is approximately 35% higher than an average rate. Although the in-game currency price almost completely returned to normal at the end of the month, it might slightly go up again. Square Enix launched a Free Login Campaign til the end of August for all ex-FFXIV players who hadn’t played the game over 30 days. In addition, it is strongly believed that the developer should use this opportunity to keep players active such as summer sale on the in-game market or even the game itself to attract new faces. Final Fantasy XIV Gil price in August will be slightly lower than in July. The cheapest was on July 28, 2016, which is 5mn FFXIV Gil for $15.52 and the most expensive was on July 04, 2016 for $20.50. It was 34.69% higher than an average price. Surprisingly, Guild Wars 2 announced Living World season 3 in an early July adding new contents and game modes to the game. It had been 2 years after the release of Season 2 back in 2014. 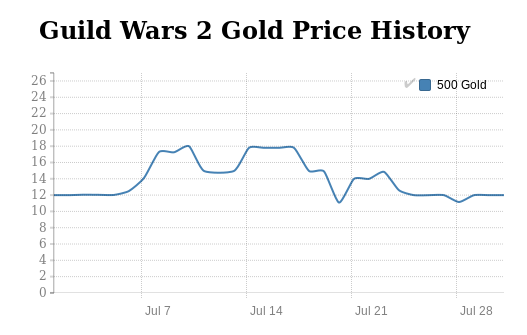 This news alone shook the RMT market causing a sudden 50% rise in GW2 Gold price. However, the price quickly went down and returned to its normal price even during the launch date on July 26. It seems like players are not much interested in the game anymore. Guild Wars 2 in August is expected to be lower and should be in the range of ~$11 USD per 500 Gold. The cheapest was on July 20, 2016, which is 500 Guild Wars 2 Gold for $11.08 and the most expensive was on July 16, 2016, for $17.80. The Living World Season 3 caused a sudden 55.69% price increase. The Heroes Evolved Update is finally released in July bringing changes to several features as well as introducing new race and class combination. However, it created an opposite effect to the RMT market. Instead of causing the price to be increased, WildStar Gold price was severely decreased a few days after the update. It seems like no one care much about the game anymore. We are even considering remove WildStar from the list since the game isn’t popular as it once was anymore. The cheapest was on July 20, 2016, which is 5,000 gold for $24.34 and the most expensive was on July 6, 2016, for $42.90. It was as significant as 76.25% drop. World of Warcraft had been increasing steady since the mid of June because of the upcoming expansion, the Legion, which is going to launch on August 30, 2016. However, the increase rate is lower than what it is expected, only at ~8%. At the end of July, World of Warcraft Gold stopped at the rate of $21.60 USD per 50,000 Gold. It is highly possible that the World of Warcraft Gold price will be continuously increasing and reaches its peak at the end of August. And then, the price is going to stay at that rate for a few weeks and start to fall down again. The cheapest was on July 20, 2016, which is 50,000 gold for $19.95 and the most expensive was on July 31, 2016, for $21.60. It was an 8.27% rise.